Mini quadcopter review - more fun that you can shake a joystick at! Post updated January 2018: For the past two years I have been seriously looking to get into aerial video and photo work. I love the thought of capturing the world from this amazing perspective. (See funny story later from this mornings practice flight with the Hubsan H107C X4C). 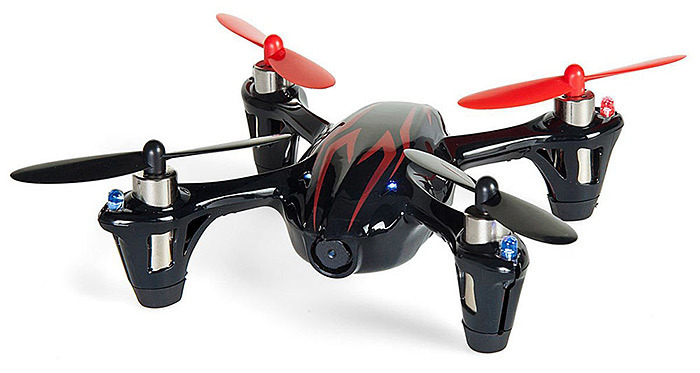 Enter the Hubsan H107C X4C Mini Drone! I used to skydive many moons ago as a young 20-something. One of the things that kept me going back for more was the women views you would get from both freefall and under canopy. I have a few memorable jumps including one which was the very last load of the day. The sun had just gone down as we took off but by the time we reached altitude, we were the only ones to see and jump into a glorious golden sunset. Brilliant. As I came into land at Headcorn parachute club, I always made the effort to take in the scenery. Fields like patchwork quilts, sheep running in all directions when they saw us coming in to land etc. Oh, and the local RC club (remote control aeroplanes) that also used the fields for their hobby. The aerial footage I have seen over the past two years has really inspired me to get into this new way of imaging. I even put a deposit on a large quadcopter 2 years ago. That came to nothing as I wanted to see what happened with regards to the regulations in the industry. It all looks good now so it is back on. Anyway, I thought there is no way I am going to learn to fly a quadcopter straight off the bat with a £2-3k set up. So, I looked around for a cheap practice module that uses the same controls. What a cool little "toy" and this one even comes with a 2mp 720p HD camera installed. Great for practicing (although I thought I'd broken it (see video))! Propeller guard for indoor flying (NEEDED)! It really is pretty simple after a few times and you will get going in no time. This is pretty basic but for the price, it does the job well. You cannot control the camera (on/off) or do anything but fly the drone which to be honest, at this stage, that is all you want to do. It takes 4 AA batteries and "non-rechargeable" are recommended. I am still on the first lot after around 20, 6 minute flights and they are still showing full power. In mode 2, you have the usual throttle and turn functions on the left and directional controls on the right (see above). BUT, you can swap this around when you switch to mode 1. This little thing is fasssst when you fly it forward at full pelt so be careful! The Hubsan H107C X4C is amazing. I have crashed it numerous times into walls, behind the sofa and even dunked in underwater in the salty sea and it still flies! The whole thing is made of plastic but it is tough. I have only broken one rotor as the guard (recommended) does its job really well. Its motor arms are designed to "snap" apart instead of breaking when you crash it and simply click back into place…cool. After a few flights, I got pretty confident with the Hubsan H107C X4C Mini Drone. I found myself able to land it anywhere, even on my children's outstretched hands. I'm still not entirely happy with turning the quadcopter and flying it in another direction as it gets really confusing at the moment. I've a tendency to always face forward and simply fly to and fro until I get more confident. However, yesterday was the first day in a while where we had barely any wind so I took it over the road to the beach. This thing is so fast outdoors with no walls or ceiling to hold it in and the first thing I did, with the camera running, was to shoot it in the air. It went SO fast that within seconds it was just a dot in the sky. I couldn't make out which way was forward so inevitably when I started flying it, coupled with slightly stronger winds at that height, sod's law dictated that it should head off out to sea! Of course, I panicked and just pulled all controls towards me and the thing started to plummet out of the sky. As it got closer to the water I powered it up again and it stabilised fairly close to the water. However, somehow (durr, I am rubbish at this right now), I panicked again. The Hubsan plopped into the water about three feet from dry land and submerged fully. Now I am gutted because to retain footage, you HAVE to turn the camera off for it to process the clip but in my panic I pulled the battery out and the footage was gone. When I tried to start it again, the rotors were acting up so during the walk of shame home, I kept buzzing them all the way back to keep it moving and hopefully dry it off a touch. When I got home, and after my wife had stopped laughing at the thought of my face during all this, I stripped it apart (pretty easy). I blew like mad into all the moving parts and put it back together. To my amazement, it worked as flawlessly as ever although it seems the camera is kaput. I will work on that to try and get it back and running but for now I am just happy that the cool little Hubsan H107C X4C Mini Drone is still flying. Not much else to say other than if you want the real specs on this, check out other reviews online or use the Amazon links below where there is more info and user reviews. I get a small kickback if you buy through me which helps the site run so thank you. These reviews take me a long time. The recommended age for this is 14 but I think my 11 year old is more than capable of flying it. So, if you are looking to make your kids very happy this Christmas, or for their birthday, just get them one of these. If nothing else, it will keep them quiet (except for the constant buzzing like a bunch of flies) for hours. Thanks for reading and feel free to leave your own experiences and comments below! Edit 2018: 3 years on and I have been running an aerial video business all that time. Flying in the Tate Modern gallery in London was fun and I've also flown for a team from Pinewood Studios. Filming for the BBC and Channel 4 was superb and things are looking great for the future of drones so get involved. Start with this little beast and learn to fly and enjoy the buzz!